This article originally appeared in LDS Daily on June 27th, 2017. On June 27, 1844, not longer after singing “A Poor Wayfaring Man of Grief” to his cellmates, John Taylor lay suffering on the floor of Carthage Jail. 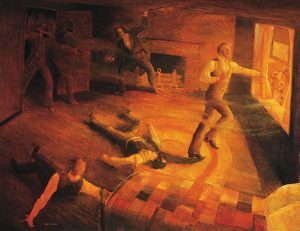 He had endured terrible injury at the hands of an angry mob that had just killed the Prophet Joseph Smith and his brother Hyrum. This tragic event became a defining moment in the history of the Church and in the life of John Taylor. 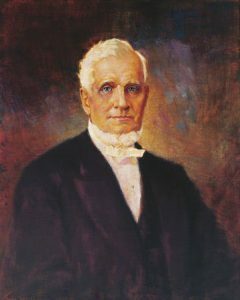 John Taylor, by John Willard Clawson. Courtesy of the LDS Media Library. Soon afterwards I was sitting at one of the front windows of the jail, when I saw a number of men, with painted faces, coming round the corner of the jail, and aiming towards the stairs. The other brethren had seen the same, for, as I went to the door, I found Brother Hyrum Smith and Dr. Richards already leaning against it. They both pressed against the door with their shoulders to prevent its being opened, as the lock and latch were comparatively useless. 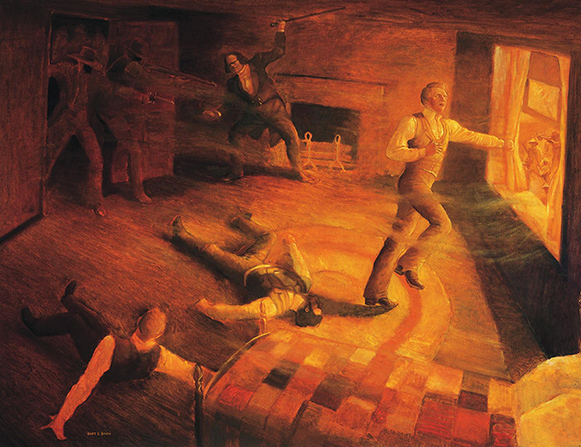 While in this position, the mob, who had come upstairs, and tried to open the door, probably thought it was locked, and fired a ball through the keyhole; at this Dr. Richards and Brother Hyrum leaped back from the door, with their faces towards it; almost instantly another ball passed through the panel of the door, and struck Brother Hyrum on the left side of the nose, entering his face and head. At the same instant, another ball from the outside entered his back, passing through his body and striking his watch. The ball came from the back, through the jail window, opposite the door, and must, from its range, have been fired from the Carthage Greys, who were placed there ostensibly for our protection, as the balls from the firearms, shot close by the jail, would have entered the ceiling, we being in the second story, and there never was a time after that when Hyrum could have received the latter wound. Immediately, when the ball struck him, he fell flat on his back, crying as he fell, “I am a dead man!” He never moved afterwards. I shall never forget the feeling of deep sympathy and regard manifested in the countenance of Brother Joseph as he drew nigh to Hyrum, and, leaning over him exclaimed, “Oh! my poor, dear brother Hyrum!” He, however, instantly arose, and with a firm, quick step, and a determined expression of countenance, approached the door, and pulling the six-shooter left by Brother Wheelock from his pocket, opened the door slightly and snapped the pistol six successive times; only three of the barrels, however, were discharged. I afterwards understood that two or three were wounded by these discharges, two of whom, I am informed, died. I had in my hands a large, strong hickory stick brought there by Brother Markham, and left by him, which I had seized as soon as I saw the mob approach; and while Brother Joseph was firing the pistol, I stood close behind him. As soon as he had discharged it he stepped back, and I immediately took his place next to the door, while he occupied the one I had done while he was shooting. Brother Richards, at this time, had a knotty walking-stick in his hand belonging to me, and stood next to Brother Joseph, a little farther from the door, in an oblique direction, apparently to avoid the rake of the fire from the door. The firing of Brother Joseph made our assailants pause for a moment; very soon after, however, they pushed the door some distance open, and protruded and discharged their guns into the room, when I parried them off with my stick, giving another direction to the balls. It certainly was a terrible scene: streams of fire as thick as my arm passed by me as these men fired, and, unarmed as we were, it looked like certain death. I remember feeling as though my time had come, but I do not know when, in any critical position, I was more calm, unruffled, and energetic, and acted with more promptness and decision. It certainly was far from pleasant to be so near the muzzles of those firearms as they belched forth their liquid flame and deadly balls. While I was engaged in parrying the guns, Brother Joseph said, “That’s right, Brother Taylor, parry them off as well as you can.” These were the last words I ever heard him speak on earth. Every moment the crowd at the door became more dense, as they were unquestionably pressed on by those in the rear ascending the stairs, until the whole entrance at the door was literally crowded with muskets and rifles, which, with the swearing, shouting, and demoniacal expressions of those outside the door and on the stairs, and the firing of guns, mingled with their horrid oaths and execrations, made it look like pandemonium let loose, and was, indeed, a fit representation of the horrid deed in which they were engaged. After parrying the guns for some time, which now protruded thicker and farther into the room, and seeing no hope of escape or protection there, as we were now unarmed, it occurred to me that we might have some friends outside, and that there might be some chance of escape in that direction, but here there seemed to be none. Not possessing any power to move, I felt myself falling outside the window, but immediately I fell inside, from some time, at that time, unknown cause. When I struck the floor my animation seemed restored, as I have seen it sometimes in squirrels and birds after being shot. As soon as I felt the power of motion I crawled under the bed, which was in a corner of the room, not far from the window where I received my wound. While on teh way and under the bed I was wounded in three other places; one ball entered a little below the left knee, and never was extracted; another entered the forepart of my left arm, a little above the wrist, and passing down by the joint, lodged in the fleshy part of my hand, about midway, a little above the upper joint of my little finger; another struck me on the fleshy part of my left hip, and tore away the flesh as large as my hand, dashing the mangled fragments of flesh and blood against the wall. My wounds were painful, and the sensation produced was as though a ball had passed through and down the whole length of my leg. I very well remember my reflections at the time. I had a very painful idea of becoming lame and decrepid, and being an object of pity, and I felt as though I would rather die than be placed in such circumstances. It would seem that immediately after my attempt to leap out of the window, Joseph also did the same thing, of which circumstance I have no knowledge, only from information. The first thing that I noticed was a cry that he had leaped out of the window. A cessation of firing followed, the mob rushed downstairs, and Dr. Richards went to the window. Immediately afterward I saw the doctor going toward the jail door, and as there was an iron door at the head of the stairs, adjoining our door which led into the cells for criminals, it struck me that the doctor was going there, and I said to him, “Stop, Doctor, and take me along.” He proceeded to the door and opened it, and then returned and dragged me along to a small cell prepared for criminals. Martyrdom of Joseph and Hyrum, by Gary E. Smith. Courtesy of the LDS Media Library. Brother Richards was very much troubled, and exclaimed, “Oh! Brother Taylor, is it possible that they have killed both Brother Hyrum and Joseph? it cannot surely be, and yet I saw them shoot them;” and elevating his hands two or three times, he exclaimed, “Oh Lord, my God, spare Thy servants!” He then said, “Brother Taylor, this is a terrible event;” and he dragged me farther into the cell, saying, “I am sorry I can not do better for you;” and, then, taking an old, filthy mattress, he covered me with it, and said, “That may hide you, and you may yet live to tell the tale, but I expect they will kill me in a few moments.” While lying in this position I suffered the most excruciating pain. Soon afterwards Dr. Richards came to me, informed me that the mob had precipitately fled, and at the same time confirmed my worst fears that Joseph was assuredly dead. I felt a dull, lonely, sickening sensation at the news. When I reflected that our noble chieftain, the Prophet of the living God, had fallen, and that I had seen his brother in the cold embrace of death, it seemed as though there was a void or vacuum in the great field of human existence to me, and a dark gloomy chasm in the kingdom, and that we were left alone. Oh, how lonely was the feeling! How cold, barren and desolate! In the midst of difficulties he was always the first in motion; in critical positions his counsel was always sought. As our Prophet he approached our God, and obtained for us his will; but now our Prophet, our counselor, our general, our leader, was gone, and amid the fiery ordeal that we then had to pass through, we were left alone without his aid, and as our future guide for things spiritual or temporal, and for all things pertaining to this world, or the next, he had spoken for the last time on earth. These reflections and a thousand others flashed upon my mind. I thought, why must the good perish, and the virtuous be destroyed? Why must God’s nobility, the salt of the earth, the most exalted of the human family, and the most perfect types of all excellence, fall victims to the cruel, fiendish hate of incarnate devils? The poignancy of my grief, I presume, however, was somewhat allayed by the extreme suffering that I endured from my wounds. Aleah Ingram is a full-time writer, social media manager, and editor who graduated from Southern Virginia University. Frequently whimsical and overly optimistic about how much time it will take to do things, Ashley Morales is deeply passionate about the gospel and all kinds of creativity. Her hobbies include philosophically analyzing nearly every book, play, video game, and movie that she consumes, writing music and short stories, promising herself that she will finish writing her novels, going to sleep too late, eating foods she's never tried, putting off cleaning her house, browsing Zillow, spending as much quality time as possible with her wonderful husband, trying to be a good mother to her fantastic children, and never finding the balance between saying too much and too little. One day, she hopes to leave a positive mark on the world and visit every continent (except Antarctica) with her family.